LEGO 8017 Darth Vader's TIE Fighter. Reason for sale is a familiar one to many - our two boys are growing up and now have other (expensive!). All sets have been rebuilt and are sold in good faith as complete unless otherwise stated. Lego Power Miners 8956 and 8958. These Items have been built just once. All the pieces have been matched against the instruction manuals to ensure they are complete. Also includes any spare pieces that came with them. In very good clean condition. Each play set has been bagged separately, however no original boxes! All items are listed as I see them with any flaws or blemishes that I can see and any that are not listed or mistakes in the listing are a genuine mistake on my part and not intended to deceive. From pet and smoke free home. Any questions please message. LEGO Star Wars Set 7657 AT-ST, unboxed but Complete. Preowned good condition with instructions. Reason for sale is a familiar one to many - our two boys are growing up and now have other (expensive!). All sets have been rebuilt and are sold in good faith as complete unless otherwise stated. If so, this is by accident rather than any mischief on our part so all Lego is sold on this understanding. Lego Elves 41074 Azari and the Magical Bakery, Immaculate condition 100% complete. smoke, pet free home. Complete with instructions and box. Design ID =16511 and 58119. Set number 8881. 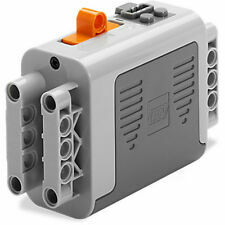 Lego Technic Power Functions AA Battery Box. Requires 6x AA batteries (not included). New genuine Lego. "International Signed" parcels cannot be sent to PO boxes except in the Middle East and Africa. LEGO 76034 The Batboat Harbor Pursuit. Good Condition, All pieces looked to be there. Maybe dusty in parts, maybe missing stickers. LEGO Star Wars Bundle 8017 Vaders Fighter 7669 Anakins Starfighter & 7657 AT-ST.
7657 AT-ST. 8017 DARTH VADER'S TIE FIGHTER. 7669 ANAKIN'S STARFIGHTER. See condition notes. 4 out of 5 stars - LEGO Star Wars Bundle 8017 Vaders Fighter 7669 Anakins Starfighter & 7657 AT-ST.
1 product rating1 product ratings - LEGO Star Wars Bundle 8017 Vaders Fighter 7669 Anakins Starfighter & 7657 AT-ST.
ALL 100% GENUINE LEGO. A lovely little starter set for your little Junior Builder to enjoy playing with Lots of fun to be had. The entire set is there even the spare bricks all in good clean condition. Lego Crawler Crane. Good Condition - All pieces looked to be there. May be missing stickers, may be dusty in parts. Bundle of Lego Duplo toys consisting of the My First airplane set plus the My First Construction Set. A missing shove and a substituted piece from construction site set, but I added another Cranky crane piece to make up for this. Please see my other listings for other Duplo bundles. The shovel and substituted Green piece are in another bundle, but I had already taken photos, so they could be reunited if bought other bundles. I am happy to combine postage costs. International postage is available. Collection welcome from Hampton PE7 8NH. Postage via Hermes tracked courier service. Postage via tracked courier service or Royal Mail, my choice on the day. Lego Construction Site. Good Condition - All pieces looked to be there. May be missing stickers, may be dusty in parts. Lego Monster Fighters - 9463 The Werewolf - Instructions & Mini figures. Condition is Used. Dispatched with Royal Mail 2nd Class. This is Lego Jurassic World set 75916 - Dilophosaurus Ambush. ASSORTED LEGO DUPLO. VANS & TRAILERS. FIRE ENGINE. CONSTRUCTION LORRIES. Rare Lego Hero Factory 44022 EVO XL MACHINE. As pictured in great used condition from a smoke free home. 98% complete build only a couple of pieces missing. Will be sent built and in a box. THIS LOT CONSISTS OF A LEGO SET 331-1 Dump Truck AS PER TITLE. AS THE MAJORITY OF OUR LEGO IS PRE-OWNED, OUR LEGO GRADING SYSTEM IS OFFICIAL LEGO ALTERNATIVE TYRES (BLACK TYRE VERSION). THEY MAY HAVE SCRATCHES, TEETH MARKS, SLIGHT DISCOLORATION OR NOT BE AS SHINY AS THEY ONCE WERE, BUT UNLESS OTHERWISE STATED THEY WILL NOT BE BROKEN AND THE PIECES WILL STILL FIT TOGETHER. 6600 Highway Construction Kit. Lego City Center. This set is becoming increasingly rare - so grab a bargain! Lego construction workers / builders with accessories. DOC MCSTUFFINS. FOR SALE IS THIS LEGO DUPLO SET. DISNEY JUNIORS. FULLY COMPLETE. Sets: Legoland: Construction THIS LOT CONSISTS OF A LEGO SET 351-1 Loader Hopper with Truck AS PER TITLE, RELEASED IN THE YEAR 1971. AS THE MAJORITY OF OUR LEGO IS PRE-OWNED, OUR LEGO GRADING SYSTEM IS. Vintage LEGO 604 : Tractor Rare with box ! Complete assembled figure with mask as seen, no gold mask, no skull spider. ZOO KEEPER. CONSTRUCTION WORKER. ALL NICE CONDITION. LEGO DUPLO ZOO big bundle. Park attendant and dinner block. Condition is Used. A brilliant Lego set to start a youngster off with the delights of building, both following instructions in the booklet (46 pages) and freestyle without any complex or TV related “themes”. Over 500 pieces of Lego, in lots of bright colours including orange and lime, wheels, doors, windows, roof pieces and all sorts. Please study the photos as what you see in the pictures is exactly what you will receive. To buy this set new costs a small fortune, grab a bargain while you can. All the Lego pieces are in good used condition, the booklet is OK but not pristine. From a smoke free home. LEGO 70100. Legends of Chima Ring of Fire. Good Condition, All pieces looked to be there. Complete assembled set with mask as seen - no gold mask, no skull spider.